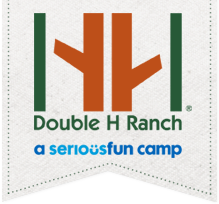 Founded in 1992 by two incredible visionaries, Charles R. Wood and Paul Newman, the Double H Ranch provides specialized programs to children living with a life-threatening or serious illness. Since opening its doors, over 60,000 children have benefited from our programs, FREE of charge. Your support is what enables us to continue providing our year-round programs to our campers. Together, there’s no telling how many lives we can touch and how many stories we can inspire as we continue to keep the promise to our campers that the Double H Ranch will be here forever.